Well I found some of these and I will 100% unconditionally Guarantee that this is the best Speaker you can buy.. This has the sound that will top the old Motorola Speaker and has a 10 Watt Rating. 6' Shielded Cord that almost will eliminate Talk-Back Squeal Large 6oz Magnet These are new and come complete with all mounting brackets and hardware.. Seriously if you want the best sound from your radio then you will want this speaker.. 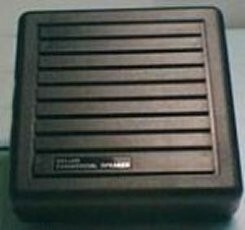 Heavy Duty Stand Speaker * 10 Watts * 6 oz. Magnet * 6' Cord * Impedance 8 Ohms. Great speaker and very fast shipping. I replaced an old, 20 yrs. old President speaker with this speaker after I lost the old one in a truck fire. Never could fin a newer model that sounded better than the old Pres., now I have. This speaker just flat out talks, distortion is low even on loud signals, and it's clear... just a great speaker! on 8/26/2012 Old Design & Great Sound! Great sounding speaker and I use a pair of them on my base set up which includes the Magnum Raptor. The cabinet in which the speaker is mounted in is design like in the old days. The enclosure makes the speaker more efficient and produces a better tone. The long shielded cable allows you to locate it in the spot you want. The mounting hardware is heavy duty. This speaker bring the voice more forward and the white noise set back so weak signals can be heard just a little better. on 1/4/2012 YES SIR !!! I must say this speaker is the real deal !!! very loud easy to mount comes with all you need !!! Must have for any cb radio !!! Love it ! Thanks again ! I was running an Aries external speaker and decided to buy one of these for a co worker. He didnt like it too much so i let him have the Aries and I put this in my truck. The sound quality is pretty good in it. I dont think its better than the Aries but not bad at all. I have not tried any other name brand speakers so i have nothing to compare it to other than the one mentioned. The price is good but I think that shipping on all products on the online stores needs to be looked at again. I think more things would sell if reasonable shipping cost was in the picture. Shipping is almost as much as the speaker. Same goes for the microphones. USPS will give flat rate boxes away. Most things can be shipped for $5.